MTT: The Dream Syndicate are said to be influential partially because while other bands were experimenting with more electronic forms of music, you were bringing back the guitar. What do you think of this statement? SW: It seemed really weird to me. We were treated almost like a novelty because we played guitars. Can you imagine that? But at that brief ugly time in history, it seemed like a weird thing to do. It just was the sound that we loved. But nobody else seemed to want to do it, so we did it ourselves. I've always said that if someone else had been making the music we wanted to hear, we wouldn't have bothered. It's only fitting that a band that can sing about 100+ years of the Grand Old Game would be well represented on the musical medium that is somehow both very old and also very new and hip. And with that, we're proud to announce that our "Volume 1--Frozen Ropes And Dying Quails" is now available on vinyl (along with Volume 2 which, strangely enough, was released FIRST on vinyl but that's another story). You can find both of these fine artifacts up on The Baseball Project's online store. Stay tuned for the release of The Broadside Ballads on 78, coming soon! Quote: "The Rhino Records store in Los Angeles already has its place in the history books, but a new documentary -- which received its world premiere Saturday with numerous former employees and label executives on hand -- further cements its identity as an inventive rule-breaking retailer." If our first tour of the year last March was dubbed the “Spring Training Tour” and then was followed in May and June by the “Regular Season Tour,” it only makes sense that the end of the Summer would have to bring – drum roll, please – the “Pennant Race Tour.” Yes, The Baseball Project is hitting the road once again and this time our endless barnstorming will take way up to the tippy-top of the Northeast and then down the Atlantic Coast. Peter will be back at First Bass (sorry, couldn’t resist) and we’ll be hitting new cities this time around and a few old favorites as well. Come out and see us mix and match from our three albums (a veritable dynasty!) and be dazzled and surprised as we toss in some odd choices from our mutual back catalogues as well as some oddities from our various record collections. Anything can (and will) happen when the four of us get together. After all, we’re kicking into high gear to make sure that we make it to the post-season. Please click here for new dates! I've recently become a fan of the work of a young animator and video director from Brooklyn named Sines and when the new deluxe vinyl version of The Days of Wine and Roses came out a few weeks ago, I had the idea of asking him to do a video for "Tell Me When It's Over." He did not disappoint and somehow got to the core of a tune that was recorded several years before he was born. Check it out. Our good pal Brigid Pearson (who designed the cover and package for "Northern Aggression" and also most of Steve's other CDs) came up with this fantastic video for the swirling, sonic adventure from the new album. The concert footage was shot in Austin and New York City. "Mark Fidrych is being celebrated in the nostalgic new song "1976," which recounts the former Tigers pitcher's fabled rookie year -- the song's title -- and his death in 2009." " former Angeleno Steve Wynn talks about Pete Rose, his World Series picks and the band itself, of course." You can hit side arrows to cycle through all the different videos in player below. And all kinds of press about The Baseball Project's latest, which you can check out by clicking here (scroll down a bit to see all the press clippings). "In his Eighties band the Dream Syndicate, singer- guitarist Steve Wynn subverted Sixties psychedelia with droning guitars and tangled skeins of lies and treachery, like a Velvet Underground score to a Fifties-noir film. Northern Aggression, made with his long-running Miracle 3, is a new peak in that hard-boiled moral aggression." "If it sounds like insider territory, fear not. As members Steve Wynn and Scott McCaughey tell Weekend Edition host Liane Hansen, baseball is often just a backdrop in the lyrics." The alt-rock super group, which includes guest members like Ben Gibbard and Craig Finn, has two albums filled with songs that are strictly about baseball. The folk-oriented lyrics talk about legends like Ted Williams, modern superstars like Ichiro Suzuki and even unfortunate team nicknames like the Twinkies (for the Minnesota Twins). "The band shouted out local openers The Breakup Society, who apparently lent their drum kit, before Buck switched from bass to 12-string guitar, giving "1976," my favorite song on the new album, a dose of his signature jangle. He stayed on guitar for the highlight of the night, a rendition of Wynn's own The Dream Syndicate song "Tell Me When It's Over." The lead-off track from 1982's The Days of Wine and Roses, it's one of the best songs of the 80s, and the band utterly nailed it last night. "This one is not a baseball song," he said. "Though the title is applicable to many of the spring training games we're watching." "
"What else besides the great American pastime could bring so many melodic rockers together? All 13 songs on the album are odes to baseball, and like the band's first outing, Vol. 1: Frozen Ropes and Dying Quails, Wynn, McCaughey, Pitmon, and Buck don't just stick to the big names and stories. With obsessive eyes for detail, they display an encyclopedic knowledge of the miscreants who play the game, the ballparks where it's played, and the myriad tragedies and comedies that color the sport's history." "When most people think of SXSW, they think of it as a showcases for up-and-coming bands � groups of youngsters who barely have recorded more than a demo and or first album, looking to "wow" the industry for a week and come away with a record deal. Steve Wynn is definitely not that. Steve Wynn has recorded over 20 albums and was ripping indie garage rock before many of those attending SXSW were born." Scott McCaughey says he still likes playing in "bad rock clubs." So what's not to love about plugging in a cheap PA system, hammering out chords on the concourse of a Spring Training ballpark in the late March desert sunshine, alongside seasoned big league musicians, and belting out lyrics to songs about baseball? "I can't wait," says McCaughey, a touring member of R.E.M. and co-founder of the supergroup inspired by the grand old game known as The Baseball Project. "I don't know how it's all going to work, but one thing I do know is that I'll get to see some games." Think of The Baseball Project less as an indie-rock all-star team than as a bunch of aging veterans proving they still have the stuff. Co-leaders Scott McCaughey and Steve Wynn, best-known for 20th-century stints in the alt-rock groups Young Fresh Fellows and The Dream Syndicate, share more than a musical history. As devout baseball fans, they share an American mythology. "Slicing Up Eyeballs caught up with Wynn last week while he was rehearsing in Athens, Ga., with one of those bands — The Baseball Project, which features his wife, Linda Pitmon; Scott McCaughey of Young Fresh Fellows; and R.E.M. guitarist Peter Buck — on the eve of a spring tour that will hit both SXSW and a bunch of spring training games in Arizona. Wynn — who graciously put up with our lousy connection ("You must have AT&T!") 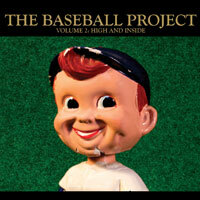 — just released Volume 2: High and Inside, the second Baseball Project album. He talked about that band, as well as his work with The Miracle 3 on last year's Northern Aggression — plus his decision to revisit a pair of classic Dream Syndicate albums live in concert." "Having read Ball Four, pitcher Jim Bouton's seminal diary of his 1969 season with the Seattle Pilots and, later, the Houston Astros, probably seven or eight times—first in high school, then each spring for a few years in my 20s—I recall this jacket blurb about it from author David Halberstam as vividly as many of Bouton's stories: "A book deep in the American vein, so deep in fact it is by no means a sports book." Comparing the Baseball Project, whose Volume 2: High And Inside (Yep Roc) came out this week (following up 2008′s Volume 1: Frozen Ropes And Dying Quails), to Bouton's revolutionary and, ultimately, humanizing look inside major-league clubhouses could be considered more than a seventh-inning stretch. " With the start of the regular season just a few weeks away, McCaughey and Wynn talked to Spinner about the origins of the band, the common ground indie rock shares with baseball and how great it would be if Neil Young played centerfield. "The Baseball Project's second album, "Volume 2: High and Inside" (Yep Roc Records) isn't available in stores yet, but you can listen to an exclusive free stream of six of the 13 songs here in ESPN.com's Music in The Life through March 1." "Steve Wynn, Scott McCaughey, Linda Pitmon (Steve Wynn & The Miracle 3, Golden Smog) and Peter Buck (R.E.M.) -- and special guests, such as Craig Finn of The Hold Steady, Steve Berlin of Los Lobos, Ben Gibbard of Death Cab For Cutie and The Decemberists' Chris Funk and John Moen -- serve up another gem with reverence and irreverence for America's pastime and some of the game's notable and notorious characters"
"Figuring out a way to combine baseball and rock and roll while getting paid for it has surely been a dream of countless Americans over the years. After all, there are few things that evoke more passion and debate than these two. " Quote: "The Baseball Project is a band featuring R.E.M. 's Peter Buck, Young Fresh Fellows' Scott McCaughey, the Dream Syndicate's Steve Wynn, and his wife, drummer Linda Pitmon, who geek out about their favorite baseball players and teams over power-pop riffage. See, indie nerds can play sports. Their new album, Volume 2: High and Inside, is on deck for a March 1 release via Yep Rock, and it features an all-star lineup of collaborators, including Yo La Tengo's Ira Kaplan, the Hold Steady's Craig Finn, the Decemberists' Chris Funk and John Moen, and Death Cab for Cutie's Ben Gibbard." Well, we had so much fun the first time that we just had to do it again. Scott, Peter, Linda and I spent much of the last few years on the road, in the studio and trading files, ideas, anecdotes and laughs and the result is the second album by the Baseball Project: "Volume 2: High and Inside." It's coming out on March 1 but you can order it here from Yep Roc Records (North America) or here from Blue Rose Records (Europe). We'll be hitting the road in March and continuing throughout the year, maybe even with some dates in Europe this time around. Read here for the story behind the record and also stay tuned for the Broadside Ballads limited edition tour CD that will also contain all seven out-takes from the two studio albums. In other words, it's almost baseball season, both in the stadiums and in the clubs and record stores. Hope to see you all soon. Hi Everybody…..Well, just about a month after the last strum of the guitar at the end of the Miracle 3 tour of Europe I'll be heading back over for a four-week acoustic tour of many of the cities I missed last Fall. I'll be playing various duo shows with old pals Chris Cacavas, Erik Van Loo and Rodrigo D'Erasmo-check out the individual shows to see who you're going to get. And there will be a few diary entries here and there-tales of travel, music, food and adventure. But I'll also be stepping up on the Twitter action so be sure to sign up to the account. Can I keep the tales to under 140 characters? Man, I meet 140 characters every day on tour! Hope to see you at one of the shows.